I tried my best to see every badge and speak with every badge maker at DEF CON 26. One thing’s for sure, seeing them all was absolutely impossible this year, but I came close. Check out the great badges shown off in volume 1 and in volume 2 of this series. 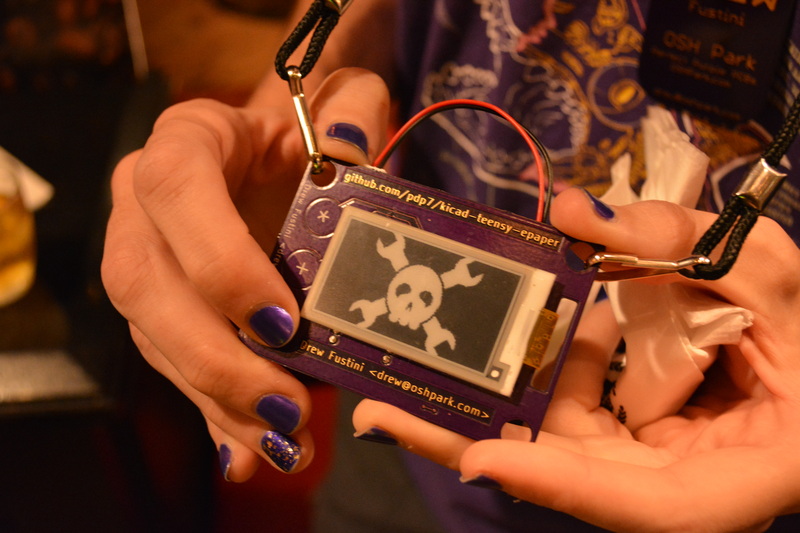 The game is afoot, and if you are headed to a hacker conference there’s never been a better time to build your own hardware badge — whether you build 5 or 500! All right, let’s look at the badges! The Hack for Satan badge is one of the biggest ‘full package’ offerings in #Badgelife. The badge design, the puzzles within, social hype around it, and the accouterments that came with it made this is an amazing undertaking. There were 300 of these badges built, and they were delivered in a VHS cassette case. One of the most striking features is that all of the components are placed to enhance the overall design, which is a beautiful bit of matte black solder mask, white silk screen, and gold plate. For instance, there is a light-dependent resistor that appears as a ring on the hand. There are LEDs and resistors in lines and arcs to create the bling, but look on the horn and bridge of the Baphomet’s nose and you’ll find really interesting placement choices. The badge features an Atmel touch controller to read the capacitive touch inputs on the glyph-filled circle. A PIC18F4520 drives the badge, with the help of 595 shift registers to manage the LEDs. The point of the badge is a puzzle described as “web crypto and stenography”. They even have their own character set which is shown on the lanyard. Unlocking puzzles activates new and increasingly impressive visualizations. You can apparently summon Satan if you get enough badges together (I’m guessing 5 for the pentagram tie-in) and perform a séance. Just look at this gorgeous fellow! I think this is the most delightful badge that I saw at DEF CON this year. The life that comes out in the design just makes me smile. Look at the adorable IR receiver as the nose! These badges recognize each other, and when they do the vibration motors under the googly eyes vibrate! There are also LEDs under the mustache itself. These are mounted on the rear of the board and shine through the substrate. Capacitive touch buttons allow for user input. But look at the interesting way these are numbered. In the land of bespoke badges, a badge with a hand-scratched series number (38 of 50 in my case) is a personal touch. An incredible offering, the Mr. Stash badge was build by @wireengineer who is of course also one of the people who built the official DC26 badge. There’s a pre-conference meetup called DEF CON Shoot where firearm enthusiasts meetup at a shooting range somewhere near Vegas. I first became aware of the badge for the event last year when a functioning desktop canon called the #boombadge. This year is another really creative take on a badge: a custom scented and dyed PMAG. A PMAG is a polymer magazine and the sand colored version begins nearly white. After boiling in water, it can be soaked in Rit dye, then boiled again and soaked in banana scent. From there, a custom sticker made to look like what you’d find on a banana, finishes of the look — it’s a banana clip! Well, a banana mag I guess. A yellow LED and coin cell finish off the look. They produced 145 of these badges. The Goon Box Badge is a sonic screwdriver that includes a TV-B-Gone in addition to the bling. But it’s the pin that came with the badge that I thought was the most awesome. It’s driven by a coin cell on the back and uses an IR detector to listen for any IR traffic, illuminating the red LED when a carrier signal is found. It’s a super-simple IR notifier that turned out to be really fun at a con where a lot of badges are spamming IR! Kudos to @hamster and the DC801 badge crew who set out to build 400 of these beautiful badges and managed to have a 100% yield! They designed the badge as a way to fund the DC801 party and their Hackerspace in Salt Lake City. Presales accounted for 350 of these badges, with the other 50 in tow at the conference itself. Inside you’ll find a Wargames style tic-tac-toe. The badges use the Rigado BMD-300 module which combines a Nordic nRF52832 — a BLE radio and ARM Cortex M4F — with power management, an antenna, and FCC certification. These modules became extremely popular with badges built for DC25. You’ll also find a microSD card slot and there’s a footprint for an FTDI chip (unpopulated) for anyone who wants to do some hacking via USB. The badge also has a serial bootloader, though, so anyone with a USB-to-serial cable can do firmware updates after the con. Learn more about the badge on the repo. If you’re a HAM radio operator, this Trans-Ionospheric Badge should get your blood pumping. This also uses the BMD-300 mentioned earlier, which provides an ARM controller and BLE support. At first I thought it was a 5 GHz and 10 GHz radio, but that’s not the case. The badge is a peripheral for just such a radio — the Phase 4 Ground which is an open source design based around an FPGA. You can learn more about the badge itself on the project page. Simple, but so amazingly well done! This is the Illuminati Badge and it’s hand-made by @_kredence who spent about 2.5-3 hours on each of the 23 badges he made. The face of the PCB uses glossy black silk screen with white solder mask and I don’t believe bare copper plays into the design. There are 97 LEDs that line the triangle, and connect the points to the eye at the center. That eye looks spectacular thanks to a 3D printed diffuser that fills the two cutouts of the eye (the sclera and pupil are cutouts, the iris itself is PCB). LEDs on the back of the badge edge-light this diffuser for the final result. The badge is using an Adafruit Feather 328P to drive the animations. This was partially chosen because the Feather board already has LiPo handling for the 18650 cell that powers the badge. The LEDs themselves are driven by an IS31FL3741 LED driver chip by ISSI which has been quite a popular family of parts with badges this year. 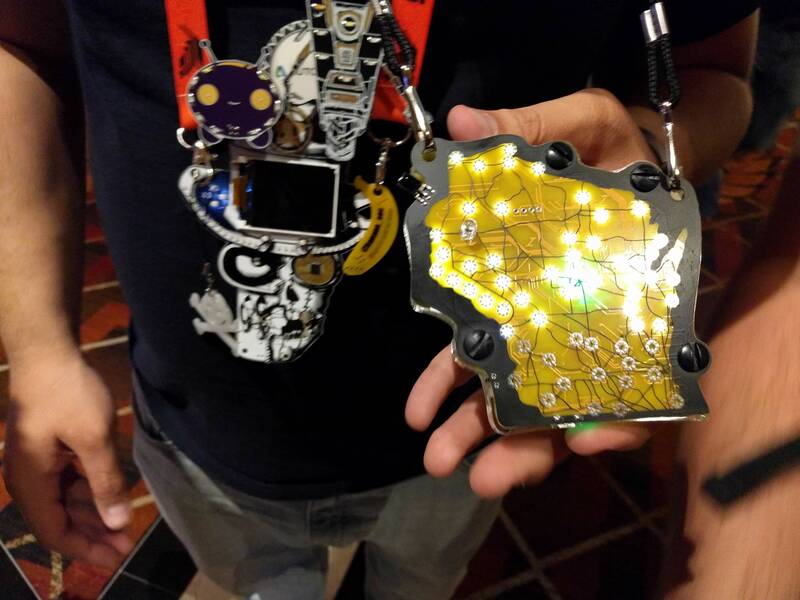 I ran into Ashwin K. Whitchurch at Breakfast at DEF CON and was delighted to see he had made a custom badge just a few days before heading to the con. It’s based on the same circuit he used for HeartyPatch, the wearable single-lead ECG which you may remember seeing in the 2017 Hackaday Prize. 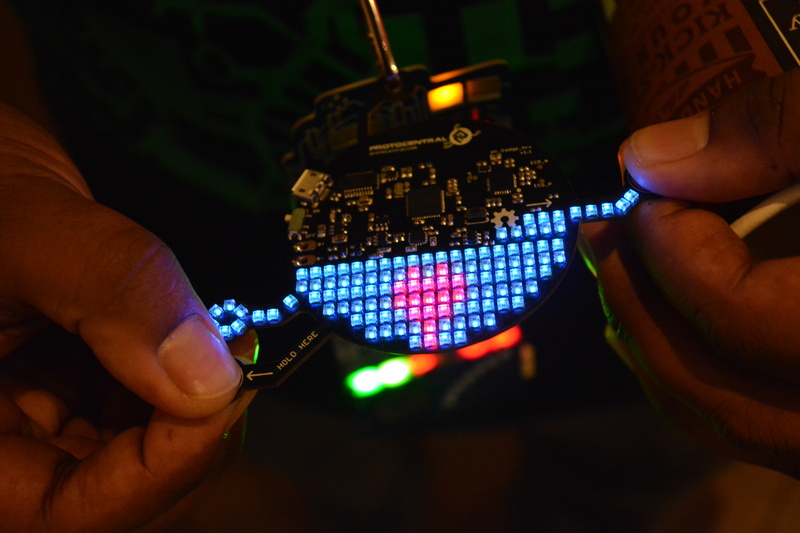 Two of the HeartyBadges were made, each with 144 LEDs. The exposed copper on two circular appendages can be pinched between thumb and forefinger to detect and display your heartbeat! This badge is a map of the state of Wisconsin. It’s a stack up of acrylic frames, with a PCB on the top. I love the use of bare FR4 in this design as it makes a very nice diffuser for the LEDs that dot the map. Although I didn’t have a chance to speak with @D1g1t4l_T3mpl4r about the design, I’m told that the IR receiver seen in the upper left lets the badges detect one another. When that happens, a different part of the map is unlocked in the visualizations. Update: Addie sent over a link that has more about the design an construction of the WiscoBadge. I’ve been surprised by what can be pulled off with solder mask, silk, screen, and bare copper. 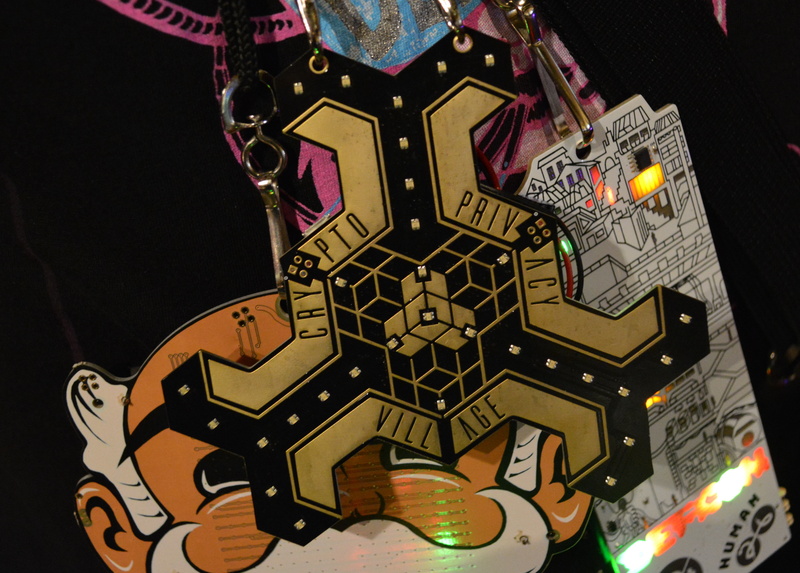 But look at the face of the Crypto and Privacy Village badge this year. It’s devoid of silk screen and yet still looks stunning! The use of gold-plated copper, and the judicious placement of solder mask for lettering and outline give it the look of machined metal rather than PCB. The minimalism of using only one type of package (RGB LEDs) on the front furthers the effect. The copper pads are capacitive touch and I believe the lights on the badge form the halls of a maze (back me up in the comments if you have more info). It’s also awesome that this is a tessellation; the badges placed together form a solid shape with no gaps. The badge is built around an ESP32 but also includes an EFM8 microcontroller. As with last year’s offering, it draws power from a LiPo cell and can be recharged via the micro-USB port. Of course there is a challenge built into the hardware and it ties into the Gold Bug PUzzle. At one point there was an excellent visualization of the badge layers but I can now only find it on this Tweet. What do you do when you have too many add-ons and want to wear them all? You make badges for the sole purpose of holding and powering them. That’s what @CromulonBadge is all about. Here we have the Minecraft sword which holds three add-ons. There is also the It’s Always Sunny In Philadelphia badge which is… well, just watch that series (based on the worst people on earth) and you’ll eventually get to the episode that covers this badge. I had hoped this would be the final giant installment, but there were just too many badges. I have one final article headed your way (with at least as many badges as you see in this one) to finish up our DC26 badge coverage. Keep your eyes on Hackaday! yeah, but why not zoidberg? IMO,The Stash badge really needs a nose clip! I’d love to get a WiscoBadge for my wife (Wisconsin native). The CPV badge visualization now lives at https://2018.badge.cryptovillage.org/. It was temporarily on the goldbug site as a teaser. does the satan badge play ‘transylvanian hunger’ when you unlock all the things?